SEFA artist, James Isherwood, has recently been awarded a fellowship by the Virginia Center for the Creative Arts (VCCA). Located in Amherst, Virginia near the Blue Ridge Mountains, James will be among 25 Fellows focusing on individual creative projects this summer. Born in Falls River, Massachusetts, James graduated with a BFA from Parsons School of Design in 1993. 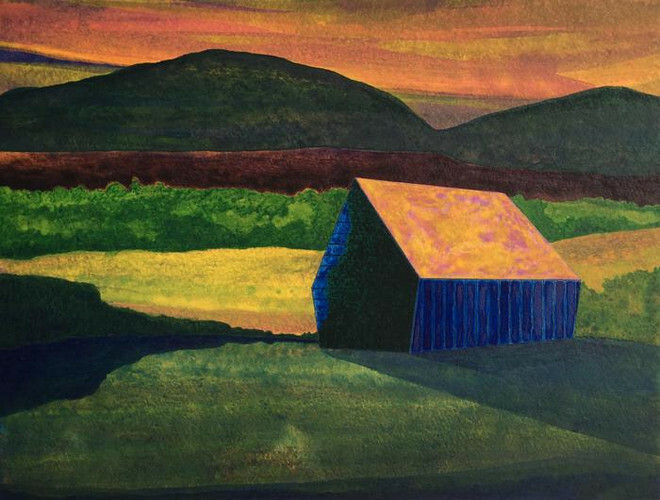 Now based in Brooklyn, James’s current series of work represents generic images of barns that combine formal abstract painting with drawing, and focus on the interaction of geometry, color, and texture—the latter achieved in as many as 100 layers on a single painting in a process of layering, sanding, and imprinting objects. Using the simple geometry of the rural framework, James explores the subtle changes in space, color relationships and developing structures. His paintings attempt to bridge the gap between the world we live in and the journeys forged by our imagination. To see more of James Isherwood’s work, visit Susan Eley Fine Art. To learn more details about the VCCA Fellowship program, please click here. 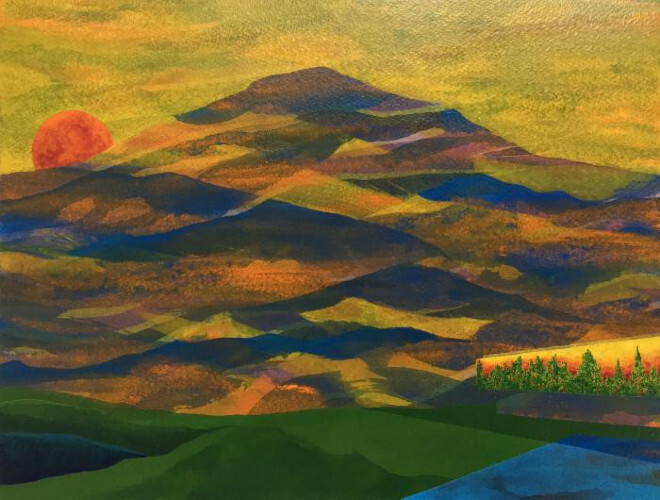 James Isherwood, Golden Hour, 2018, acrylic on paper, 12.25 x 16 inches. James Isherwood, Future Memory, 2017, acrylic on paper, 9 x 12 inches.